First Line: Gunna stamped the snow from her boots and flinched as the overpowering heat of the hotel's lobby hit her like a slap in the face. Sergeant Gunnhildur Gísladóttir of the Reykjavik Police has been called to one of the city's nicest hotels to check into the death of an older man found tied to a bed in one of the rooms. It looks to be a plain old garden variety heart attack in the midst of a bit of extramarital hanky panky, and there are absolutely no signs of criminal activity. However, the more Gunna looks around, the more she senses that there's more to the man's death than meets the eye. Given the go-ahead by her boss, she begins to dig deeper, but the investigation turns very deadly very quickly. Chilled to the Bone is an intricately plotted novel that moves like an Indy car racer from the second Gunna sinks her teeth into the investigation. 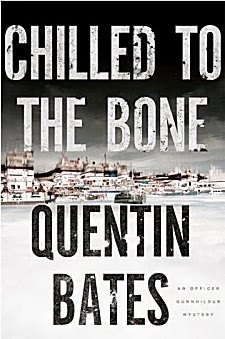 From a woman doing a bit of discreet prostitution to insure her family's survival, to a very bad guy back home in Iceland after being released from prison in another country, to a missing laptop and very nervous government officials, Quentin Bates has crafted a tale that will keep readers piecing clues together until its conclusion. But this book is much more than a clever story-- it has a central character who's rapidly become one of my very favorites. Gunna Gísladóttir juggles her professional and personal lives with practicality, intelligence, and a much-needed sense of humor. On the job, she inspires confidence in those around her with her self-deprecating air of calm and no-nonsense. She has an unerring intuition as she works her investigations, and fortunately she's got a boss who lets her run with it. When the terrier-like woman finally calls it a night and goes home, she seldom seems to get the peace and quiet she deserves, and it's due mostly to her son, Gísli. Gísli has a job on a fishing boat. Instead of a girl in every port, he has girls in one port... and they seem to be getting pregnant and showing up on Gunna's doorstep while he's off to sea. It's easy to see why she needs a sense of humor! Above and beyond all this, Bates lets us see that Gunna has secrets in her past, and he's being very slow in revealing them. Chilled to the Bone, liberally laced with laughter and menace, can easily be read as a standalone, but if you crave strong characterizations, I would suggest that you begin at the beginning (Frozen Assets) so you won't miss a bit of Gunnhildur Gísladóttir. This woman is a keeper. This is just up my alley, a woman protagonist, with a good investigation and a sense of humor. I'll add it to the impossible TBR list, and hope I find it soon. And Icelandic, no less. I swore I'd read some of the books on my TBR pile first, before any more library trips or purchases, but -- one never knows. Cathy - I like the setting for this one very much. And I do like the way you depict Gunna's character. No wonder you loved it. Bates used to live in Iceland, so the setting is very well done. So, I'm on my way to eternal damnation for putting this book on library reserve. The review intrigued me so much I checked, and, presto, it was there. So, I'll look to get it. Meanwhile, my books are telling me to hurry up and read them already. I didn't get any sleep at all last night, so I had some unexpected reading time. Good thing I was right in the middle of a (so far) excellent book!